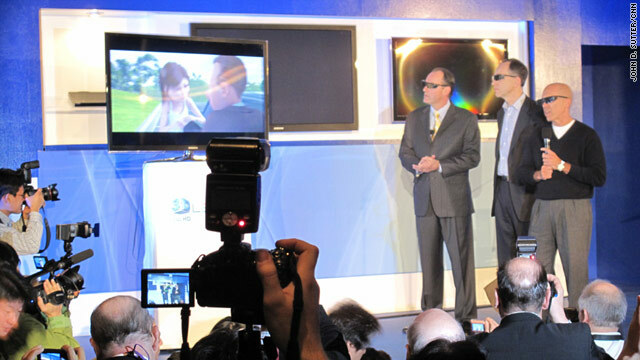 DreamWorks, Technicolor and Samsung announced a partnership Wednesday to bring 3-D TV into homes. Las Vegas, Nevada (CNN) -- Samsung dove headfirst on Wednesday into a number of technology trends already making waves at the Consumer Electronics Show. In a whirlwind press conference, the electronics company downplayed the impact of the recession on the electronics industry before revealing a new e-reader in partnership with Google Books, an open-source app store for television sets, an MP3 player with a translucent screen and a 3-D television that's said to be the width of a pencil. Through all of the announcements, though, the South Korean company seemed most focused on expanding the capabilities of home televisions -- making them more connected to the Internet and other devices and, now, with the launch of "Samsung Apps" in the spring, giving them the ability to do whatever tech developers want them to do. Television "can be almost anything you want it to be," said Tim Baxter, president of Samsung electronics in North America. "TV can be your DJ, your gaming opponent, your travel adviser, your weather man. TV can even go shopping with you." With the help of 3-D technology, its content also can jump off the screen. Samsung is one of a number of TV makers here promoting televisions able to create three-dimensional images with the help of 3-D glasses and content. It announced a package of 3-D TV products -- from Blu-ray players to the glasses, and a home theater -- which is expected to go on sale later this year. To emphasize the fact that 3-D content is going to become available for home viewing, Samsung trotted out DreamWorks CEO Jeffrey Katzenberg, who said the company's 3-D animated film, "Monsters vs. Aliens," will be available for purchase later this year. TV can be your DJ, your gaming opponent, your travel advisor, your weather man. TV can even go shopping with you. "Today, because of 3-D, we stand at a watershed moment for the entire movie industry," Katzenberg said, adding that 3-D TV is capitalizing on the medium's popularity and profitability in theaters. DreamWorks, Samsung and Technicolor announced a partnership to promote and produce 3-D TV. But, if the movie studios don't cooperate, Samsung said one of its upcoming Blu-ray players will be able to up-convert standard 2-D content into three dimensions. Baxter did not elaborate on that technology. A new line of uber-thin LCD televisions drew applause from the crowd in Las Vegas, Nevada. Samsung claimed to reveal the world's thinnest LED television, which, at a third of an inch wide, is "actually the width of a pencil," Baxter said. Samsung also jumped into the e-reader fray -- another big CES topic -- by announcing gadgets readers can use to read digital books on 6-and-10-inch screens. Called the E6 and E101, the e-book readers will be Wi-Fi enabled and will be able to store up to 1,200 books, the company said. In a video clip played at the event, Google spokesman Gabriel Stricker said the tech giant is happy to partner with Samsung to provide its more than 1 million public domain books for viewing on the Samsung readers. Both of Samsung's new e-readers also act like paper, allowing users to jot down notes on the screen. Finally, Baxter promoted a 2-inch MP3 player, the IceTouch, with a translucent AMOLED touch-screen -- a technology he said hadn't been used on portable music players before. Being able to see through the screen keeps users from having to put their fingers in front of a video they might be watching, Baxter said. "Since you can control it from the back, your fingers won't block the screen," he said. "I'll tell ya, it's so stylish you won't want to keep it in your pocket."